Studio Dog, a photo by Red Tail Designs on Flickr. 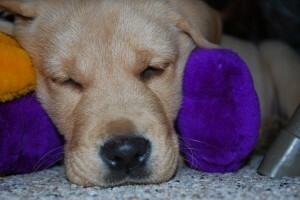 Indiana when he was a wee pup, taking a nap in the studio. for you: It’s December, the wind is swirling snow around my numb fingers as I braid horse hair out in my cold backyard. Why would I endure the nasty weather outside when I have a perfectly good studio inside? Because I was housebreaking the newest member of our family, Indiana. Treat bags to hold all of Indiana's training treats. At the time, Indiana was not yet a studio dog. He ate my craft supplies, stole my horse hair and generally got into a lot of trouble in when we made our way to the third floor. In short, I got nothing done when he was up there because it was like having a 2-year-old roaming around my studio. He also couldn’t keep out of the food or the litter box of the cat who maintains the penthouse suite, not to mention chasing the cat across my craft table was great fun. Fast forward 5 months and Indiana (as in Indiana Jones, not the state) has become a certified Studio Dog. He’s housebroken (and even rings a bell to go out) and understands the studio time is my time. He’ll comfortably sit at my feet and chew a bone while I craft. 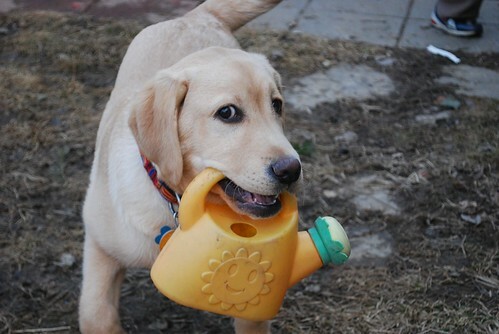 The cat food and litter box are still tempting, and chasing cats really is great fun when you’re a dog. The snap on the drawstrings lets me snap it onto my belt when we're out. I put my crafty skills to work to make some treat bags for Indiana to hold all his training treats. They’re simple little sacks with drawstring closures and snaps so I can snap them on my belt when we’re out for a walk. 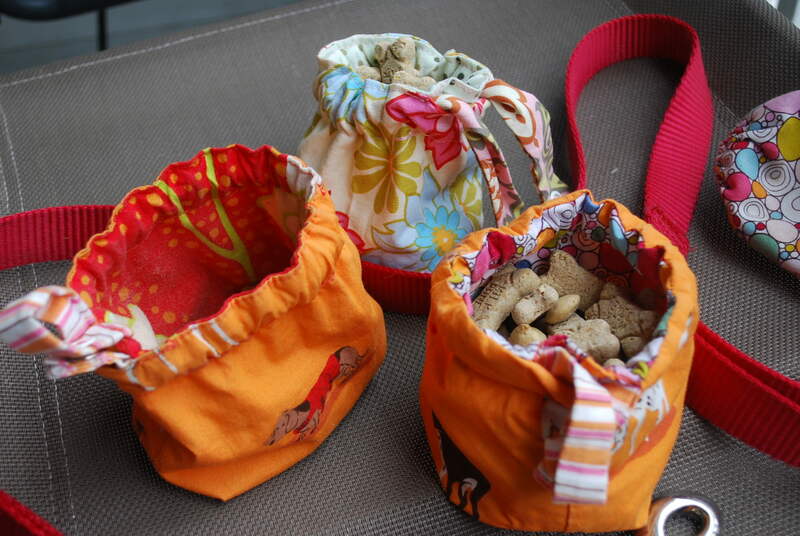 I made them of my most favorite fabric ever, the dog fabric by Heather Ross. I wish she’d bring it back, as this fabric is now out of print. After the rough run with pets we had in 2010–our 13-year-old Labrador retriever and our 10-year-old cat went to pet heaven–Indiana is a nice reprieve. He’s a super dog that is easily trainable and loves the kids. He’s sure my 4-year-old is just another puppy and probably better trained for the studio than my kids. 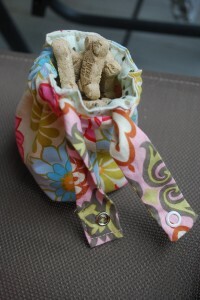 This entry was posted in About, News and tagged dog, dog treat bags, Indiana, studio, treat bags by Susan. Bookmark the permalink.